The Vredestein Quatrac 5 has again proven its worth by winning an independent all-season tyre test and leaving all newcomers in the segment far behind. The AutoBild Allrad test reinforces the fact that this true all-rounder is the perfect choice for car owners who prefer not to change their tyres twice a year, yet wish to be assured of a safe and comfortable driving performance. 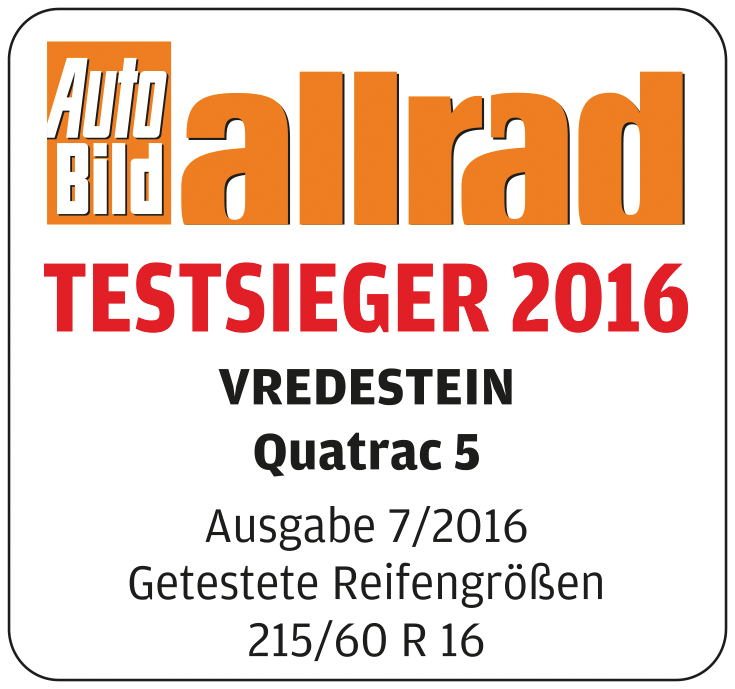 The test for AutoBild Allrad magazine involved the Vredestein Quatrac 5 in size 215/60 R16, fitted on a mid-sized four-wheel drive SUV, and tested against its main competitors. In all safety-related aspects, the Vredestein Quatrac 5 achieved outstanding results, and its performance on snow was described as particularly impressive by the magazine: ‘Excellent on snow, good grip on dry and wet surfaces and an extremely low rolling resistance.’ With a score of 3000 N (Newton) for traction on snow, ‘the tyre performs almost as well as fully fledged winter tyres’. “These independent test results are a testimony to the enormous amounts of research and the hundreds of thousands of test kilometres we put into developing our tyres, which help ensure that products like Vredestein Quatrac 5 remain a benchmark in their respective segments,” said Peter Snel, Chief R&D PV, Apollo Tyres Ltd.
Vredestein presented its first all-season tyre over 20 years ago, and introduced the Vredestein Quatrac 5 in 2014. The product is based on two decades of knowledge and experience in the field of all-season tyres and features technology that is also applied in the current generation of Vredestein’s summer and winter tyres. The Vredestein Quatrac 5 is available up to and including speed index Y, making it suitable for speeds up to 300 km/h, which is unique in the segment. The tyre also meets the growing demand from the market for all-season tyres. The Vredestein Quatrac 5 is characterised by an asymmetrical tread design. The tread on the summer side ensures excellent handling, highly accurate steering and plenty of lateral grip on dry and wet roads. The winter side, with its sophisticated sipe technology, provides outstanding traction on cold or snow-bound surfaces. The low rolling resistance reduces fuel consumption and decreases CO2 emissions. The Vredestein Quatrac 5 scores well on all three aspects of the EU tyre label, and can therefore be designated as a ‘green’ tyre. Furthermore, the tyre features the Three Peak Snowflake symbol and regular M&S coding, which implies that the Vredestein Quatrac 5, available in sizes 13 to 19 inches, meets the guidelines applicable in countries where winter tyres are compulsory.